The extreme sophistication of Carole Lombard‘s latest coiffure created for “The eagle and the Hawk” convinces us that one need not be bobbed to look chic any more. That engaging bang contrasts charmingly with the braid at the neck. Significant these long screen coiffures. Perhaps an attic or forgotten drawer may yield a braid with which to disguise your short locks in this regal manner for evening. 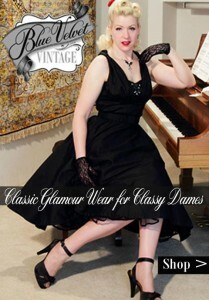 Perfect with a sheer dance frock. That bang, which lengthens the head, shortens the face, is suggested only if your eyes are large and your features are delicate. Above is another version of the bang designed for Genevieve Tobin in “Pleasure cruise” by Denis Phillips, and an ideal summer coiffure. 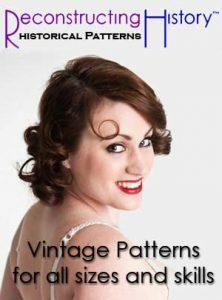 It is cool, becoming with and without a hat, requires only a handful of curls, easily obtainable by permanent or finger-wave. The piece de resistance, that bang, is very obliging, for you can both comb and curl it a number of ways. Up-keep is very small. The severity of the back is tempered by oblique tiers of ringlets. A harmonious touch is the swirl of the bang repeated at the back. This is a lovely arrangement for hair rich in color or texture, those wide swirls give it full play. The right side has full benefit of curl. The day of the over-curled head is done. A sweep, somewhere, of smooth uncurled hair seems necessary to every lovely head today. 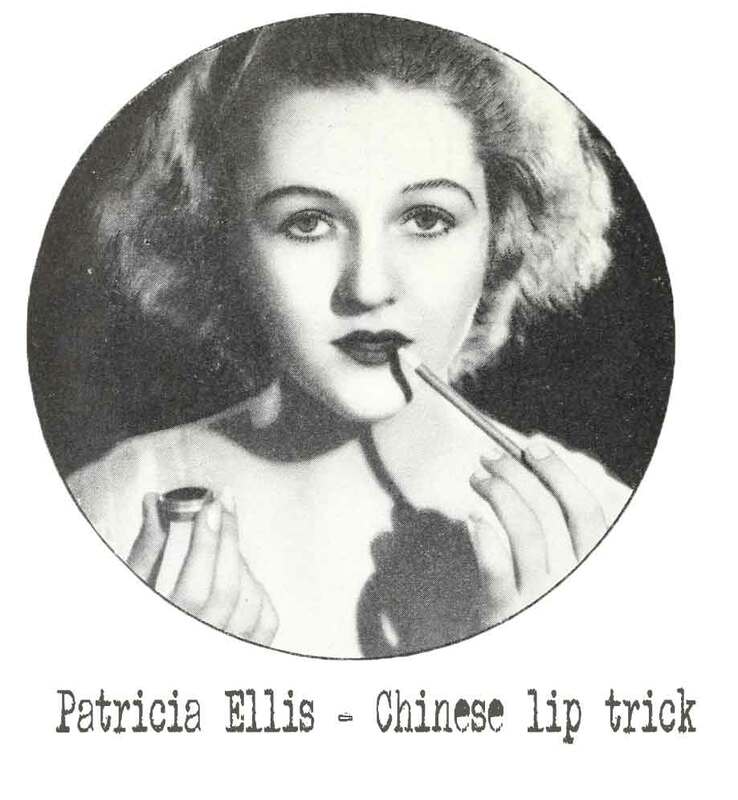 The oh so cute Patricia Ellis shows you a real studio make-up trick – that of using a Chinese brush to apply lip paste. Outline the mouth carefully, then fill in with the lip rouge. If the color is too heavy, blot gently with a tissue. 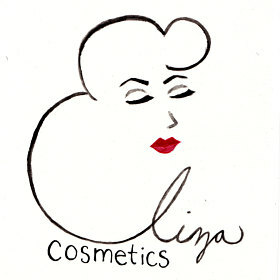 Patricia her lip pencil into her lip rouge or lipstick and fills in using vertical strokes when the mood takes her. “There are so many ways of making my lips alluring!” she smiles. How art may aid nature in luxuriant lashes is depicted by the lovely Miriam Jordan. An infinitesimal globule of paste is touched to the natural lash – the artificial lash attached to the real one. 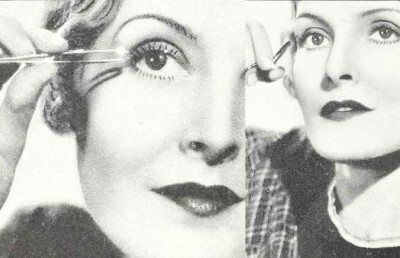 The second step to lovely lashes that defy detection – trimming them to the right length and then applying them only to the outer corner.A trick many studio artists have used since Theda Bara. This creates a glamorous sweep which some refer to as “the cat eye” ! 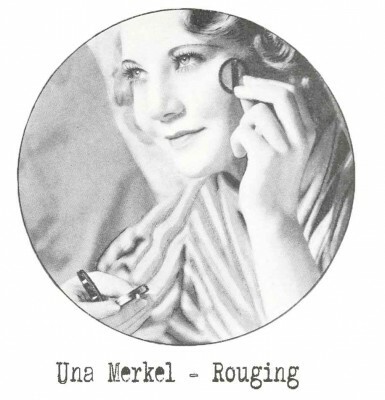 Una Merkel‘s rouge puff is carefully poised at the vital color area for the average young face. The advisability of applying rouge high on the full part of the cheeks, blending towards the temples, cannot be over-stressed for a natural and soft appearance. The same rouging principles apply to cream rouge, as illustrated above left by Una Merkel. As a rule, cream rouge is advisable for the initial application, dry rouge is suggested for a touch-up now and then. 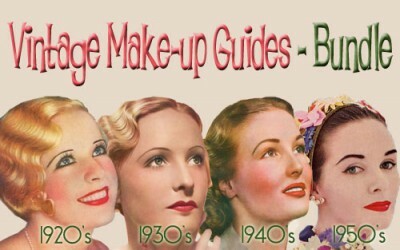 For lasting make-up. Dorothy Jordan is using one of those new one-hand lipsticks. A flip of the thumb and it opens! 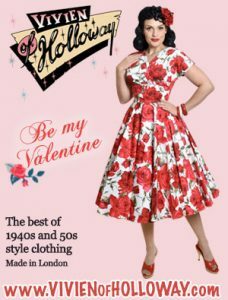 Dorothy’s skin is fair, so she chooses a flamingo or blush shade, both with rose tone. 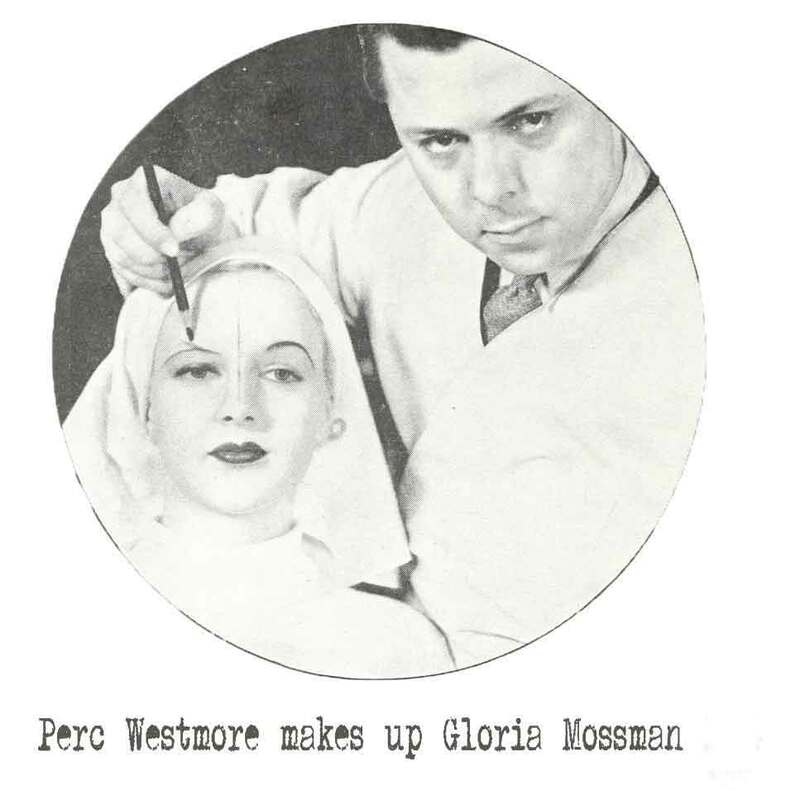 Above we see studio makeup guru Perc Westmore working his eye makeup magic on Gloria Mossman. 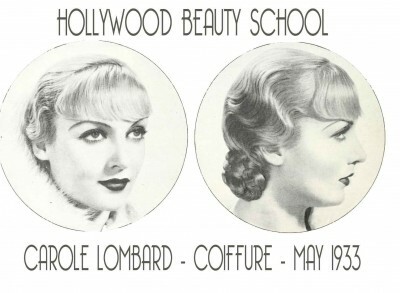 The brow to your left ( which Gloria drew in herself herself ) is too masculine. 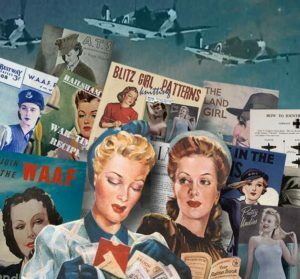 Mr Westmore advises opening up the eye and following a girls natural arch for a more feminine eye. Now some girls sadly have lower brow bones and subsequently their eyebrows are straighter and lower. 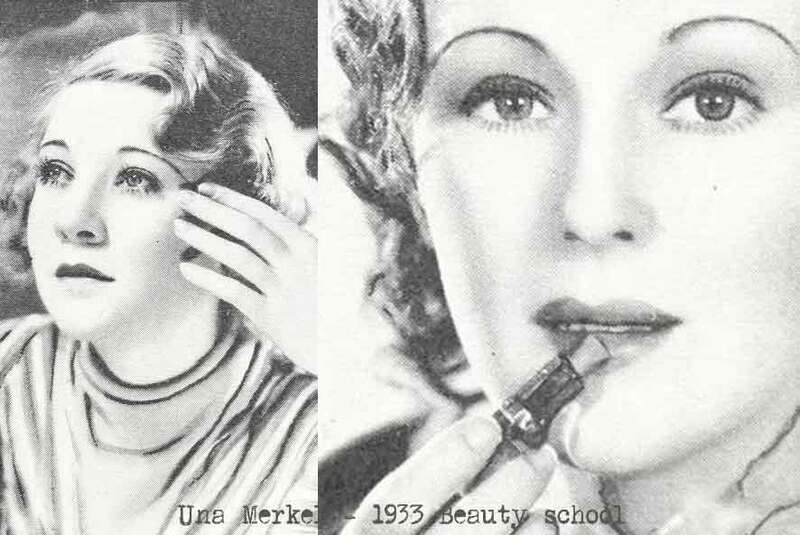 To solve – tweezers from below to raise the brow – but experiment with some concealer first. Download first to your smartphone, tablet or desktop.